Overheard, observed and eaten at Amanti Vino’s Cru vs. 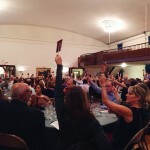 Brew 2015 event, where Skurnik wine was voted crowd favorite. Skurnik wine voted the winner at Amanti Vino showdown, Cru vs Brew. Last Thursday night, the owner of Montclair’s artisanal wine shop Amanti Vino Sharon Sevrens hosted Cru vs Brew, a wine-against-beer competition and meal to benefit Intensive Therapeutics. 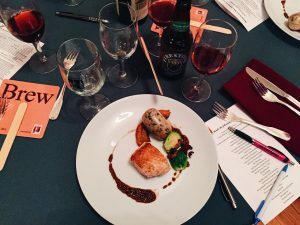 Through a lively evening of food and drink peppered with vibrant members of the community in and around Montclair, it was decided that the wines paired with the meal were the winner of the throwdown. “I fell in love with wine very early on. 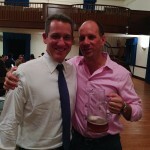 I fell in like with beer,” said Michael Skurnik, of Skurnik Wines in his opening statement at the event. 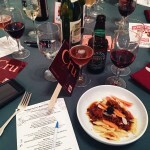 With humor, thirst and healthy competition as the event’s unofficial theme, Cru vs. Brew began. A face-off between Skurnik and Garrett Brown of Firestone Walker Brewery, the evening began with three amuse-bouches: paté on toast, spicy mussels and fried risotto fritters. 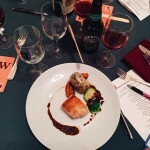 The latter, prepared by Chef Francesco Palmieri (of Bloomfield’s Orange Squirrel) intended to be representative of the yin and yang between beer and wine. “It’s half black and half white, beer versus wine,” said Palmieri, showing a photograph on his cell phone of the dual-toned fritters before their dip in the fryer. The first course, prepared by Chef Shawn Paul Dalziel (of Montclair’s Laurel and Sage), was a chili-rubbed swordfish. The fish was enjoyably fatty and sweet, charred black and seated on a bright orange sweet potato beurre blanc with crab. Instructing us to “nose the wine first,” Skurnik introduced his 2014 Gobelsburg Gruner Steinsetz and Brown spoke about the Firestone Walker’s wheat beer Bretta Weisse. 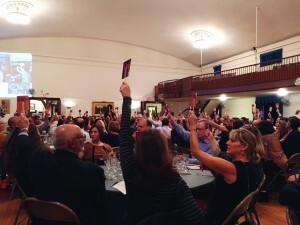 Holding up auction-style paddles, it was decided by the diners that the wine had won round one. Course two was created by Chef Ariane Duarte (of Ariane Kitchen + Bar). Duarte prepared a fresh penne pasta in lamb Ragout. Deviating slightly from the original menu concept, Duarte’s dish was served with pickled slivers of cauliflower and carrots, topped with a dollop of black garlic rosemary pesto. The pasta was made fresh by Duarte; the combination of the tart pickled vegetables and rich ragout kept me going back for bite after bite until the bowl was empty. 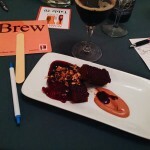 Paired with this course was what Brown characterized as Firestone’s “flagship beer,” the Firestone Walker DBA, and the wine was a 2005 Vallana Gattinara. The beer won round two. 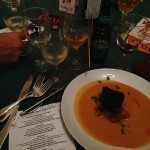 The third course, by Chef Corey Heyer (of Bernard’s Inn) seemed to be an ode to autumn. Heyer served chicken breast with housemade smoked Cremini mushroom sausage, Mangalitsa bacon, Brussels sprouts and Kabocha pumpkin with a large teardrop whole grain mustard swirled around the plate. While chicken breast is not the most exciting entrée choice, it was cooked to perfection and all elements of the plate melded together for a diverse bite. The pumpkin in particular had a pleasing, nearly spreadable texture. The sausage was smooth and well-seasoned. Heyer’s dish was paired with a Firestone Walker Agrestic, which Brown noted “sits 8-36 months in 85 percent American, 15 percent French oak barrels” and a 2002 Rolet Arbois Magnums. The wine won round three, again taking the contest lead. Course four, created by Chef James Laird (of Restaurant Serenade), was the restaurant’s take on Shepherd’s Pie, and my favorite dish of the evening. Beef braised with beer, coffee, tomato sat in a sturdy beef broth with rutabaga, mushrooms, and peas. The dish was served inside a crunchy hollowed potato skin, atop a potato purée. The beef (donated by Mastriano’s Prime Meats & Poultry) was tender and rich, pulling at the slighted touch of the fork. Following a swim in the purée and bright green sauce Laird’s dish managed to simultaneously look unique and taste reminiscent of a classic Shepherd’s pie one might find in a London pub. Paired with Firestone Walker Reginald Brett and a 2011 Mauro Molino Barolo, the wine once again was voted best. Over the fourth course, the crowd participated in an auction, moderated by Chef Palmieri and Michael Duarte, business partner and spouse of Chef Ariane Duarte. 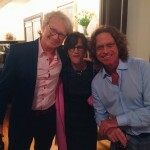 Palmieri and Duarte – between whom I had the pleasure of being seated during the dinner – were as energetic and animated on stage as they were at the table. Up for bid were events, including a behind the scenes experience at five local restaurants and a week-long wine tasting trip through Tuscany. The auction raised $16,000 for Intensive Therapeutics. At this point in the evening I couldn’t imagine making room for pastry, but knew better than to miss a dish created by Chef John Sauchelli (of Maritime Parc). The dessert course was an oatmeal stout cake that was certainly the best textured cake I’ve eaten recently, served with a milk chocolate cream, sticky sweet and sour cherry preserves and a dark chocolate oat crumble. The brew served was Firestone Walker Velvet Merlin, which Brown explained as “stylistically straight down the middle.” Declaring Sherry, an area in the southern Spanish province of Cádiz, “a magnificent magical region,” Skurnik introduced his NV Lustau Pedro Ximenez San Emilio. While the beer won this round, the votes had already declared wine the grand winner of the evening. Cru vs. 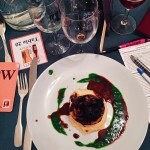 Brew was a smash success, enjoyed by diners and chefs alike, raising a huge sum for Intensive Therapeutics as a result of the auction, donations, and ticket sales (all proceeds of which will go to the charity.) Sevrens and the Amanti Vino team work hard and play harder. I look forward to their next event with great anticipation. First course at Cru vs. Brew, prepared by Chef Shawn Paul Dalziel. Course two at Cru vs. Brew, prepared by Chef Ariane Duarte. Course three at Cru vs. Brew, prepared by Chef Corey Heyer. Chris Gifford, Susan Gifford, and Michael Skurnik at Cru vs. Brew 2015. Chris Sevrens and Michael Duarte at Cru vs. Brew 2015. Course four at Cru vs. Brew, prepared by Chef James Laird. Chef John Sauchelli’s dessert course at Cru vs. Brew.